All 3D software has it's quirks, and I cannot be responsible for minor issues that result from exporting files to a non-native format. (usually, just flipped normals) However, I will work with you to try different file formats, if required. See below, on this page, for an example. Since these models produce a part of my income, the most important consideration is that you promise not to ever redistribute this 3D model file in any form. That would jeopardize my income, and ruin the value of your purchase. Otherwise, you are free to use renderings of it in any personal or commercial illustration or animation projects. Crediting Mike James as the creator is appreciated, but not required. To further protect your investment, (but not a requirement) I suggest that you avoid publishing any orthogonal images of the model. You are free to use the 3D model for any other purpose you like, including manufacturing parts for your personal use, (i.e to build a physical model at a different scale, for display or RC use) except that you are NOT licensed to redistribute, resell it, or use it for any sort of model or "kit" manufacturing. (another form of redistribution) That would fall under a specific manufacturing agreement, and I would expect to be paid a commission on those sales. Contact me before purchasing, if that is your intention. I can also provide several other modern file formats, including DXF, .OBJ, and Rhino's .3DM. Via Rhino's converter, I can also supply .3DS files, but they may need to be tweaked slightly, due to the smoothing differences when exported.. Just let me know what works best for you. Textures won't normally be a problem, because most of my aircraft have simple materials and colored polygons, rather than complex UV maps. Machine-ready formats including IGES, STEP, SAT, 3DM, and STL can also be created on special request, at an additional cost. NOTE: Some of the machine-ready formats can be exported in multiple ways. For example, a non-closed model can be exported as an STL file, even though it wouldn't be considered "watertight", and would therefore be unsuitable for machining. If you require true solids, it's important to let me know that at the beginning, because there are additional steps I'll need to take. (capping some parts, thickening others, etc..) If you're new to these terms, have a look at the brief article here, which explains the differences. You'll notice that the more expensive models in my 3D Catalog have a very high polygon count. If you're accustomed to using models with simpler geometry, whose details are faked with texture maps, you may wonder why. It's simple, really. When the actual geometry exists for things like tire treads, doors, windows, hatches, and other details, it means two things. First, the model's details aren't dependent on the quality or resolution of the image maps you use. It also means that these parts are separate, and can be animated. So yes, some of these files can be a bit tedious to interact with within 3D software, (depending on your hardwaresoftware setup) but the rewards are greater realism in close-up rendering and animation. The first thing, which you'd expect, is the rigging info. 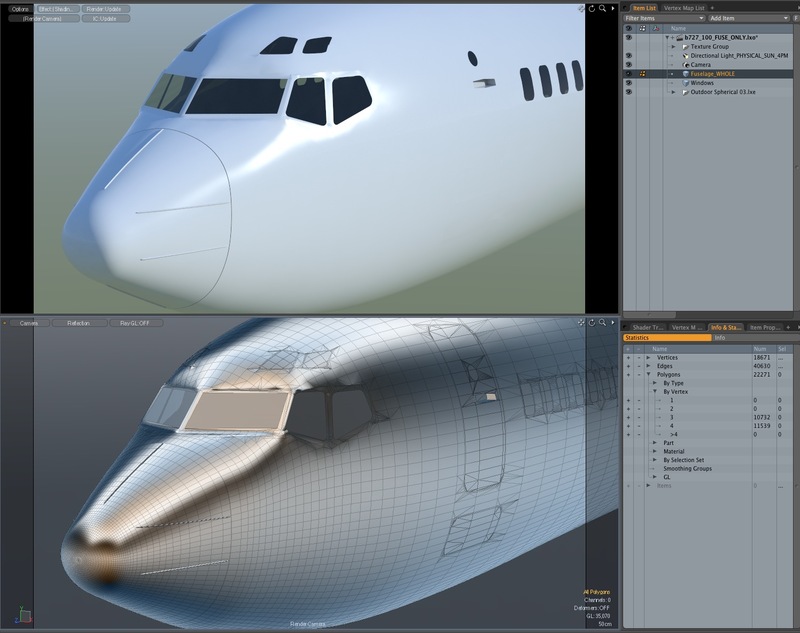 Most software has it's own proprietary way of handling these setups, and MODO is no different. You'll get all the parts, along with their locators, but the actual control sliders themselves will not appear, and some of the centers (or "pivots") may not appear in the correct spots. Depending on the file type you request, sometimes the polygons must be converted in one way or another. For example, the model may have to be converted to all triangles, for STL export. The next three images are actually 1600 pixels wide. Drag them to your desktop to view them full-size. These images show the difference between polygon configurations, and their render quality. This is a worst-case scenario, with the hard-polygon fuselage having a highly reflective material, and a single directional light at an intentionally-harsh angle.The important thing to notice is that while apparent smoothing errors are visible in the (reflective) preview mode at the bottom of each image, they all render equally well. Chances are slim that you would encounter anything like this with one of my Catmull-Clark models, such as the new version of the Piaggio P180. Every renderer has it's own parameters, and will handle these things slightly differently. So, when you first look at a model you've received from me, in some sort of preview mode, do a test render, to see if there's actually any effect. All the settings I've used here, in terms of "smoothing angle", etc., are MODO's standard defaults, with nothing special added, so they should render equally well in your application. Here, as part of the file conversion process for export, I've triangulated all the Ngons, leaving a mixture of quad polygons and triangles. In this final example, I've triangulated the entire model.